An assertive plan by Pluto to gain power over his brother, Zeus, culminated with the kidnapping of Hercules and Venus from the UCLA campus. Angel, Iceman, Black Widow and Ghost Rider, who just so happened to be on campus at the same time, journeyed to Olympus to battle alongside Hercules and Venus against the villainous Olympians. Following their experience in Olympus, the five heroes (Venus stayed behind) decided to band together to lend aid to the “common man”. Utilizing his newly-inherited wealth, Warren Worthington III (aka the Angel) set the team up with their very own headquarters and flying vehicle (the Champscraft). During their official debut’s press-junket, they were attacked by Darkstar, the Griffin, the Titanium Man and the Crimson Dynamo. These super-powered Russians were seeking revenge against the Black Widow’s friend and mentor, Ivan … and it was up to the Champions to defend him. After defeating the Russians, the not-so-villainous Darkstar remained behind and joined the team in an unofficial capacity, tagging along on every other future adventure. The team also took on another unofficial member as Black Goliath joined the party in issue #11 (mere months after his own solo title was cancelled). 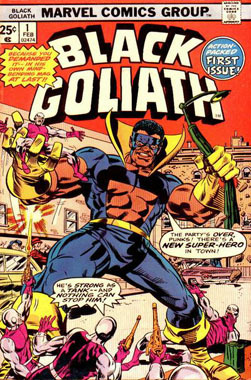 [On a curious side note, it was revealed in the letters pages that Black Goliath was originally slated to be a member of the team but, the powers-that-be said they didn’t want a member of the team who was already headlining his own book. So who did they add in his place? Ghost Rider! And, I’m sure we all realize that the Rider was already headlining his own book …. go figure!] Along with the size-altering hero came an unresolved plot from his short-lived series. The origins of the mysterious box that had been stolen from his Stark warehouse were unveiled in a cosmic adventure that involved Kamo Tharn (the Possessor) and the Stranger! Finally, following battles against Swarm, Doctor Doom & Magneto, Sentinels and the Brotherhood of Evil Mutants (Blob, Lorelei, Unus the Untouchable and the Vanisher) the series came to an end with issue #17. However, the saga of the Champions did not end there. The letters pages promised that we would see them disband in a future issue of the Avengers. And, while that wasn’t exactly the case, the team’s end was shown in flashback in Peter Parker the Spectacular Spider-Man #17-18 (also written by Mantlo). Years later, the original team reunited and teamed up with X-Force (in a 1998 Annual) to fight Pluto, the Lord of Hades, yet again. The Bad: As many letter-writers complained early on, this team’s existence was seemingly “pointless”. The X-Men were outcasts, the Fantastic Four were a family, the Avengers had the market cornered as “Earth’s Mightiest Heroes”, etc. Every super-team had a niche at the time … except the Champions. They just … were. Although, the writers tried to define them as the “team for the common man”, realistically, the team had no true purpose, which can be seen in all of their stories. Everything that goes on in the book happens to them. They don’t proactively embark on any of their adventures. Another common complaint was the team’s line-up. The characters never really meshed well. Angel and Iceman were already friends (from their time in the X-Men) but none of the members seemed to form any real friendship besides the comraderie of battle. The only real ongoing characterizations were (1) Ghost Rider felt the other members were scared of him (this subplot began to build some steam just as the book was canceled) and (2) Iceman continually mused to himself that he would quit the super-hero business once the team got established. In fact, some of the characterizations seem a bit off in this book. As mentioned previously, the fun-loving Iceman was not so fun-loving in this title. He wanted to “grow up” and quit the team and super-heroing altogether. And Hercules, known for his love of battle, ale and women was straight-laced and stern, here. Ghost Rider rarely got any spotlight (except to cry about the team being scared of him) and was even missing from some stories because he was doing other things in his own solo book, at the time. The series seemed to come to an abrupt end but fortunately, Mantlo dedicated two issues of his Spider-Man title to sufficiently wrap everything up. the Good: For a short-lived series, the Champions added some important bits to Marvel’s continuity. For starters, the Angel revealed his identity to the world and also got hold of his huuuuuuuge family inheritance. It also introduced the 1970s-recession-inspired villain, Rampage (who later appeared in the 1990s Wonder Man series) and Swarm (a slightly more prominent villain who’s since joined Spider-Man’s rogues gallery). It debuted some new costumes (albeit short-lived ones) for Angel and Iceman … and wrapped up a plotline that was left dangling from the Black Goliath series. Some of John Byrne‘s earliest Marvel work can be found in the latter half of this series. It’s clearly the high-point of the book art-wise … and even storywise. At this point, Bill Mantlo had caught his stride and, with the additions of Darkstar and Black Goliath, the title was at its most fun and adventurous point. The Verdict: Two ex-X-Men, a former Russian spy, a demigod and the spirit of vengeance. An unlikely team, to be sure. And, they certainly were! 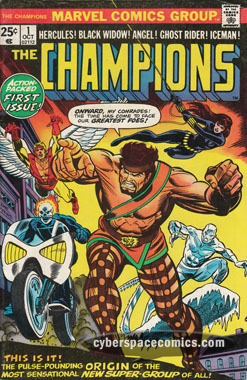 The Champions were a short-lived super-team that started out as a yawn-inducing read. Slowly but surely the book got more fun and interesting (mostly due to the creative team of Bill Mantlo and John Byrne) as the size of the team grew. But unfortunately, this strange mix of heroes just couldn’t compete with other team books at the time and the title was canceled, leaving the story to be completed elsewhere. I wouldn’t recommend sitting through the first half but #11-17 make for some fun Marvel super-hero stories. 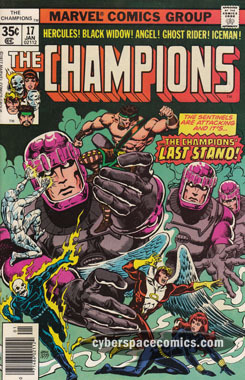 On an interesting note, Eclipse Comics published a six issue mini-series called the Champions, based on an RPG in 1986. Marvel didn’t pursue them legally for two reasons: (A) It had been eight years since their own Champions title was published and (B) the Eclipse series was only a limited series. Well, that was a mistake on their part because the limited series paved the way for an ongoing series. Hero Comics published an ongoing series in 1987 and by that point, they’d gotten their foot in the door, legally. In 2007, when Marvel’s 50-State Initiative was in full force, they were going to reinstate the Champions as California’s official super-hero team and give them their own book. But, they quickly found out that Hero (now called Heroic Publishing) wouldn’t let them use the name … so they changed it to the Order (and it only lasted for 10 issues, anyway). Kurt Busiek‘s writing credits are quite extensive but he’s probably most well-known for his interesting look back through Marvel’s continuity in Marvels as well as his creator-owned titled Astro City. He’s also had significant runs on the Avengers and Thunderbolts that are still well-regarded today. 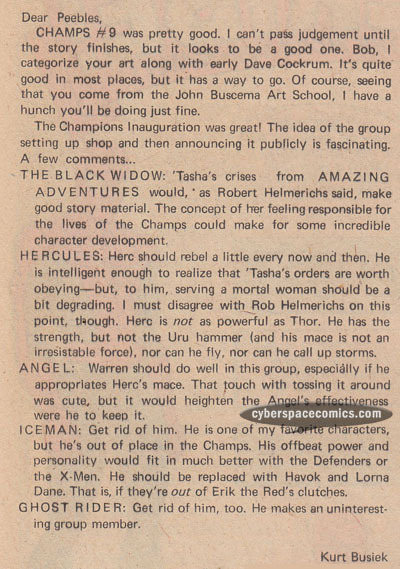 Prior to hitting it big in the comics industry, he was following the Champions (among many other books, I’m sure) and got a letter printed in the Champions #12 (cover date – March 1977). You’d be hard-pressed to find a better Hulk writer than Peter David. His decade-long run redefined the Hulk for a whole new generation, running from 1987 to 1998. 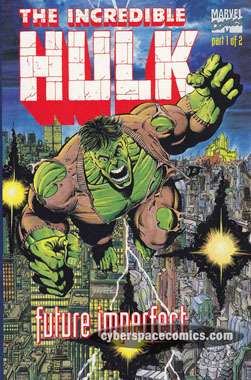 Midway through this magnificent feat, David paired with another well-regarded comics creator, George Perez, to produce a two-issue mini-series pitting the current Hulk (in his Professor Hulk state of being) against the Maestro (a future version of the Hulk who has taken control of the world – and not in a good way). The only hope the future has against the Hulk is … the Hulk! Forty years ago, Logan was witness to a gangland murder after spending the night with Katrina McCann, a cocktail waitress. Turned out that Katrina was the girl of local mob boss, Phil DeBlasio, and he had his guys give Logan a pounding. Now, a mysterious letter has drawn him back to the scene of the crime with hopes of uncovering the truth behind that long-distant night. He finds it suspicious that he came across his old fling again, after all these years … and a new, young girl is pursuing him who has some secrets of her own. Who summoned him there? What are these women hiding? And, will Wolverine find the long-since-missing criminal? Although the cover depicts him in costume, this really isn’t one of those costumed adventures. There’s no big, cliche-spouting super-villain to take down. But, it’s another neat look into Logan’s shady and mysterious past. 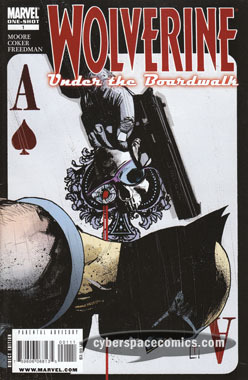 The artwork is appropriately moody and sketchy, enhancing the “pulp” feel of the storyline. It’s unlikely that any of these characters will resurface again in any significant role but, when one has lived a life as storied and well-traveled as Logan’s, there are sure to be tons of bit characters with only one or two tales to tell. Everyone loves a good story where the hero gets the girl, right? But what if the hero you’re rooting for falls for a girl who is forbidden? In a modern day superhero homage to Shakespearean tragedy, Marvel Comics introduced readers everywhere to the quintessential star crossed comic book couple; Gambit and Rogue. 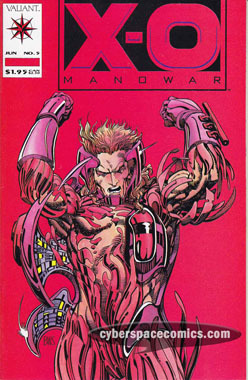 Gambit: A Louisiana-bred ladies’ man with the ability to charge objects (he favors playing cards) that explode on impact. Since his introduction by Chris Claremont and Jim Lee into the world of the X-Men back in 1990, Gambit has cemented his place as a fan favorite hero. Rogue: The X-Men’s southern belle, Rogue’s powers are her curse; she involuntarily absorbs the memories, physical strength, and super powers of anyone she touches. This potentially fatal power prevents her from making any physical contact with others, which creates a huge hurdle for her relationship with Gambit. 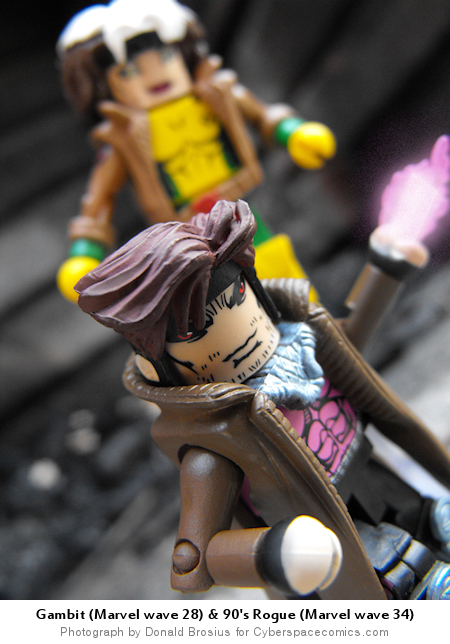 In order to give Rogue the appearance of flying, I used a Minimate flight stand, then I simply placed Gambit directly in front to cover it. The only photoshop work I did with this image was the glow effect for Gambit’s power, which was an extremely simple 2-layer process, since I only had to add some highlights to the included charged-card accessory. After fifteen years away, Dr. William Barrett Foster moved back to his hometown of Los Angeles after accepting a job to head up a Californian Stark Industries facility. Unknown to Stark, or anyone else for that matter, Foster recently acquired Pym particles that allow him to grow to 15′, donned a costume and adopted the super-hero name of Black Goliath (see Power Man #24). But, it works out well for Stark, since Black Goliath has moved to L.A. just in time to stop Atom-Smasher from stealing a new supply of radium from the warehouse! The book continues to follow Foster’s new career as a crime-fighter, as he learns the ropes … and even meets a nice lady named Celia Jackson who’s clearly attracted to his costumed alter-ego (even though she’s unaware of his secret identity). And, while attempting to disrupt a crime-spree by the Stilt-Man, Goliath along with Celia and her nephew are transported to a new world by the criminal’s Z-Ray! In the final issue, the trio meet a kindly alien named Derath who helps them escape the planet, Kirgar, to which they’ve been unwillingly trapped on. Creative Team Change – The book switched writers after only one issue! Fortunately, the series doesn’t suffer from a noticeable shift in tone but, it’s certainly a strange move to leave the book so early in its life. 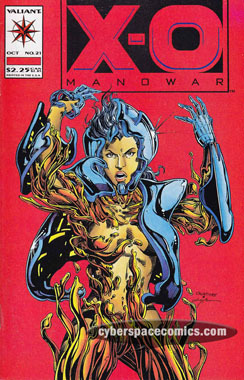 No Guest Stars – Marvel often includes mainstream guest-stars in the first few issues of a series to gather interest in a new hero. Occasionally, Tony Stark makes a cameo on a view screen to talk with Foster or his co-workers but his alter-ego, Iron Man, never makes an appearance – nor do any other big-name heroes. Lame Villains – If a series doesn’t include famous heroes, then often the other solution is to pit the new hero up against a well-known villain to gather some interest. 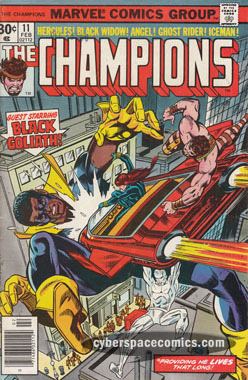 In this case, Black Goliath is pitted up against new villains: Atom-Smasher and Vulcan. And, when he is given a “name-brand” villain it’s Stilt-Man. Stilt-Man! C’mon! It’s a guy on stilts … with a ray gun. the Good: I’m often intrigued by characters that are or can grow to larger than life proportions. This guy’s no different and I was instantly drawn into his story and the great, dynamic art. It was fun to follow a new hero who has significant ties to existing Marvel characters (he first appeared in a very early issue of the Avengers; he uses an improved-upon Pym Particles formula; he made his costumed debut in Power Man). And, placing a super-hero on the West Coast was a novel idea for Marvel at a time when all of its heroes were based out of NYC. Continuing with my praise of “novel” premises: this is Marvel’s second series starring a black character. Certainly a noteworthy character in terms of diversifying the super-hero population. The Verdict: Although I was quickly drawn into the series, the unresolved plot-lines left a poor taste in my mouth. No one wants to end a story with so many strings left hanging. 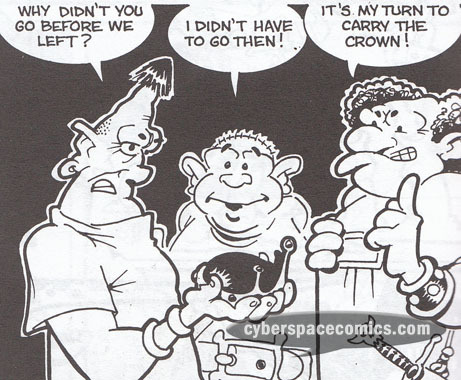 If the series was able to come to a natural conclusion, I’d be able to recommend it more … alas, that was not the case! As an interesting note here, the alien that Claremont created in issue five belongs to the A’askvarii race. I think you’ll notice that it’s very close to the spelling of the Askani, which he later linked to the X-Men’s future. Ralph Macchio is probably most well-known for his editing work at Marvel Comics, though he has some writing credits to his name on titles such as the Avengers and the Sword of Solomon Kane. But, before gaining employment with Marvel he was a loyal Marvel Comics follower. 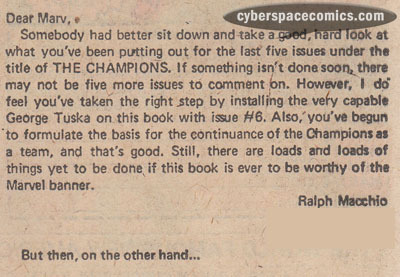 He got a letter printed in the Champions #7 (cover date – August 1976), displaying some early evidence of his editing ability. Jim Shooter launched the Valiant Universe with three golden-age heroes (Turok, Magnus & Solar) as well as his own creations. One of these new creations was X-O Manowar, a centuries-old Visigoth named Aric Dacia, armed with a living armor that was taken from an alien spacecraft. Eventually, he gifts the armor to his friend Randy and it takes over her. Swiping the cover of issue #5 seemed like a great way to mark this event. And, when something sells well (as X-O Manowar initially did), it’s only natural that a parody of it will come along. 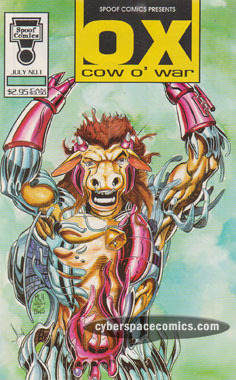 With that in mind, Spoof Comics published OX, Cow o’ War and used this issue as the basis of their cover swipe.